At Studio Art and Technology, I worked with a twenty-person team to create a wide variety of props for film and television. 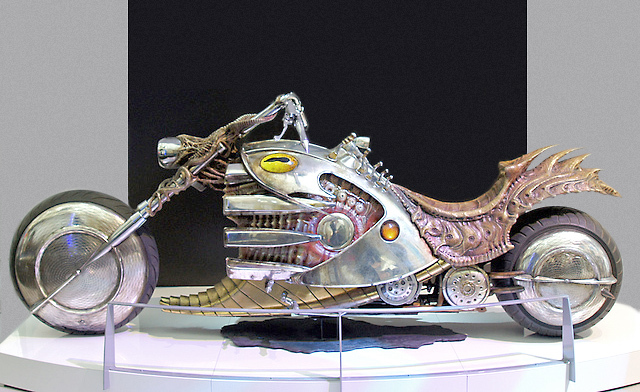 The scale and intricacy of the projects varied wildly, but the two pieces shown here, created for Men In Black III, were undoubtedly the most complex. We worked long hours over the course of six weeks, contemporaneous with many other projects, to complete these full-scale bikes. The Boris Bike is a fully functional motorcycle, welded and constructed in-shop. Working in a three-person team, I did most of the fiber-resin molding of the exterior parts, including the seat, fuel-tank and hubcaps, utilizing hundreds of pounds of silicon, clay and fiberglass in the process. I also assisted with much of the chroming and some of the finishing to make the pieces look organic. See below for details. Since it was not a functional bike, The Hover Bike was more dreamlike in design. We created two full-scale Hover Bikes and one partial for compositing. I performed the molding on the large rings and primed and chromed all the parts in a four-person team.